The P-100 simplifies fire extinguisher training by utilizing clean-burning propane. It's ease of operation and realistic flame signature lets instructors focus on teaching critical techniques. Fires can be ignited and shut off on command. The P-100 fire extinguisher trainer can be used alone or with one of the four interchangeable props. All required accessories are included (propane tank sold separately). KFT's Portable Fire Extinguisher Trainer P-100 provides an economical and realistic means of training factory and office personnel in the proper use of handheld fire extinguishers. Essential skills are taught using the Fire Extinguisher Trainer P-100, such as how to select the correct extinguisher for class A, B and C fires, how to evaluate the fire, and the correct way to aim and use the fire extinguisher. The P-100 is completely portable and can be easily transported, setup, and operated by one person. All fires are controlled by the instructor and can be instantly ignited and shut off. This means greater student safety and a higher number of students that can be trained in less time. The P-100 trainer is constructed of stainless steel, making it robust and easy to maintain, and it burns environmentally-acceptable propane. The P-100 is compatible with virtually all extinguishing agents, providing a convenient and realistic training experience. 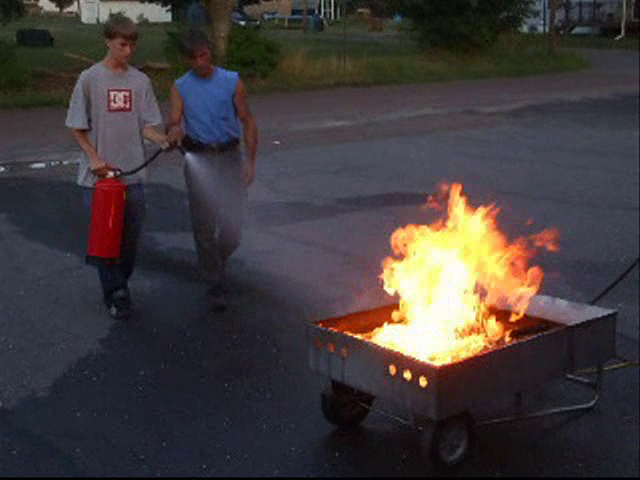 Optional props are offered for the P-100 trainer to create various fire scenarios, such as a waste paper basket (class A), paint locker or stove (class B) and electric motor (class C). "I am very pleased with the Fire Extinguisher Trainer P-100. Its portability, ease of use, and cleanliness is a great asset. My instructors who utilize it are also pleased. When we take it to our classes or to any type of training scenario, the participants and even the other agencies are impressed by it as well." We are sorry, but your browser does not support video tags. Download the video here instead. See a Fire Extinguisher Trainer P-100 in action!